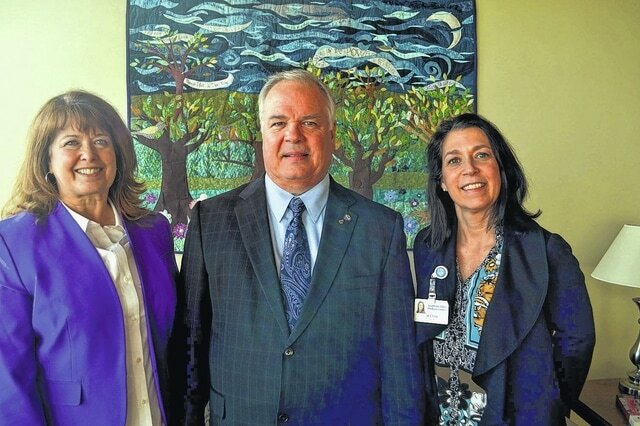 Left to right: Sharee Price, Senator Uecker, and Wendi Waugh, Administrative Director of the Cancer Services and Community Health and Wellness for SOMC. South Central Ohio Educational Service Center’s Gifted Services Coordinator, Sharee Price, met with Ohio Senator Joe Uecker to discuss the Ohio Arts Council’s Artist-in-Residency Program and the impact it has made on thousands of students in Scioto County. The Artist-in-Residency Program provides grants for professional artists to work intensively with students usually for a three-week period. The program encourages community partnerships and the ESC has built a strong partnership with Southern Ohio Medical Center. Portsmouth High School students together with OAC Artist, Kate Gorman, created two quilted wall hangings which are permanently displayed in the SOMC Cancer Center which Senator Uecker visited Monday.